Europeans have been making frequent visits to South East Asia for as early on as the 15th Century. First the Portuguese, then the Dutch and eventually the British and the French. The French went inland into Indochina whilst the British made their presence felt in Indonesia, Malaya, Burma and Singapore - strategically along shipping routes. With regions secured (well, almost - apart from insurgence uprising by the Malays now and again), came the trading companies and along with that, changed the course of South East Asia's history. Captain Francis Light -first sculptured based on features of his eldest son William Light. 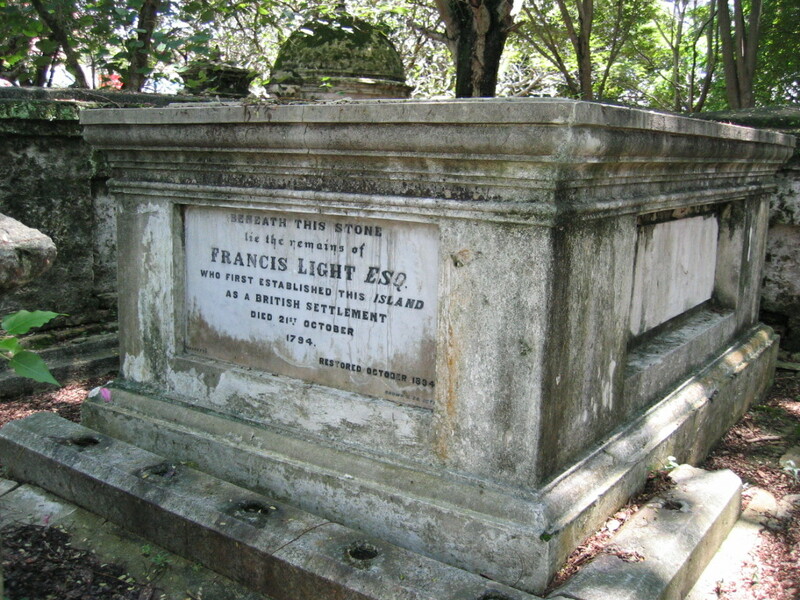 Francis Light was born in Suffolk, England in 1740. At age 19, he entered the Navy as a midshipman. After four years' service in various junior appointments, he went to India and became master of a ship trading between India and the Malay Peninsula. Francis Light picked up colloquial Malay and in no time made fast allies in Malaya. Sir John MacPherson, the Governor-General of India. Light recommended two stations, Junk Ceylon (modern name, Salang), where he had his own headquarters, and Penang, which he was able to offer on behalf of the young Sultan of Kedah, with whom he was friendly. Finally, Light was able to negotiate a settlement whereby Penang was ceded to the Company for the annual payment of £1,500. Francis Light became the first superintendent and moved his partner Martina Rozells of Thai-Portuguese descent and 2 children including young William Light who later followed his father's footsteps in reputation and founded the city of Adelaide. In fact Penang has a history that goes way back to the days of the Malaccan Sultanate in the 14th century. Portuguese traders from India used Penang as their replenishment centre for water, food and traded with the villagers. The main stopover point was at Batu Feringghi or Feringghi's Rock. The word Feringghi is an Indian term for Europeans. Today, Batu Feringghi remains a lure to Europeans. Beach resorts and hotels gradually replaced Fishing and Malay Villages that used to line this beautiful beachfront. Today, a walk down Batu Feringhi and one familiarity pops to mind - Pattong, Phuket. well, minus the sleaze and women sliding down pole bars. (Still a great place to go for families). Batu Feringghi has maintained quite a bit of its charm despite the sudden influx of restaurants ranging from steak houses and Indian cuisine to seafood outlets and even a large food court selling local food at reasonable prices. In the evenings, the walkway along the main street disappears as the night market vendors take over the area. Visitors can find all sorts of handicraft work, pirated movie and music VCDs/DVDs, Von Dutch handbags and t-shirts (fake!!) and some pretty kitsch items for sale. The good side to this is that although the hustle and bustle is there at Batu Feringghi, it's still only found mainly along the main street. For those looking for peace and quiet, one can retreat into the comforts of their hotels, the tranquility of their pool areas or on the beach. Once within the sanctuary, sanity restores. Francis Light renamed Pulau Kasatu as Prince of Wales Island on 12th August 1786; to commemorate the birthday of the Prince of Wales, later, George IV, and the capital became George Town. However, naming the island Prince of Wales Island didn't really catch on with the inhabitants and later reverting to Penang Island. When Light landed at Cape Penaigre (now Georgetown), he found that the interior of the island was almost impenetrable, leaving no open land to establish a camp. In his diary, Light complained, 'the wood is so exceedingly hard that the tools double like a piece of lead'. Exasperated, he came up with an ingenious idea of filling a cannon with silver dollars and firing into the jungle. Then he hired onlooking natives, armed them with axes and had the jungle cleared of tough ironwood trees (Pegaga Laut) in no time! Light had his men build a wooden stockade within the clearing. 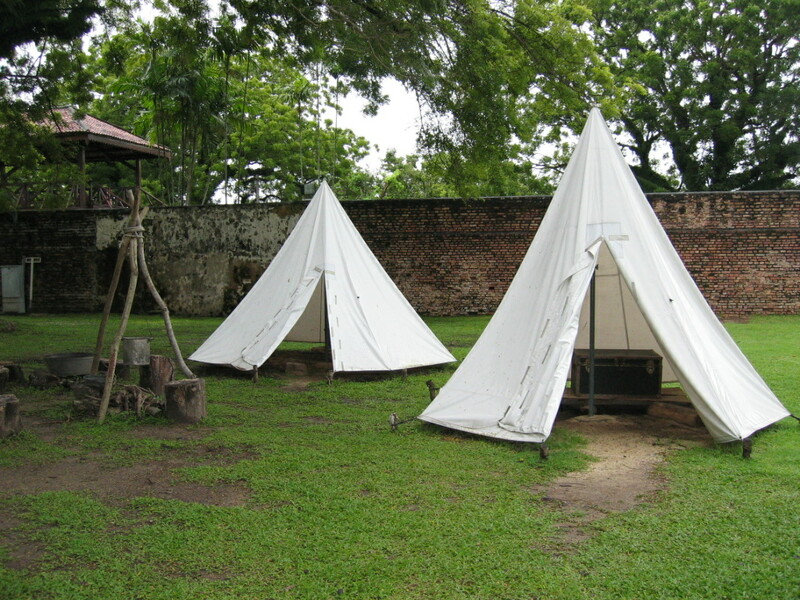 Later convicts were put to work on a construction of a fort on the same site. Light named the fort after the Governor-General of the EIC - Charles Cornwallis. The total cost of the fort amounted to 67,000 Spanish Dollars in 1793. 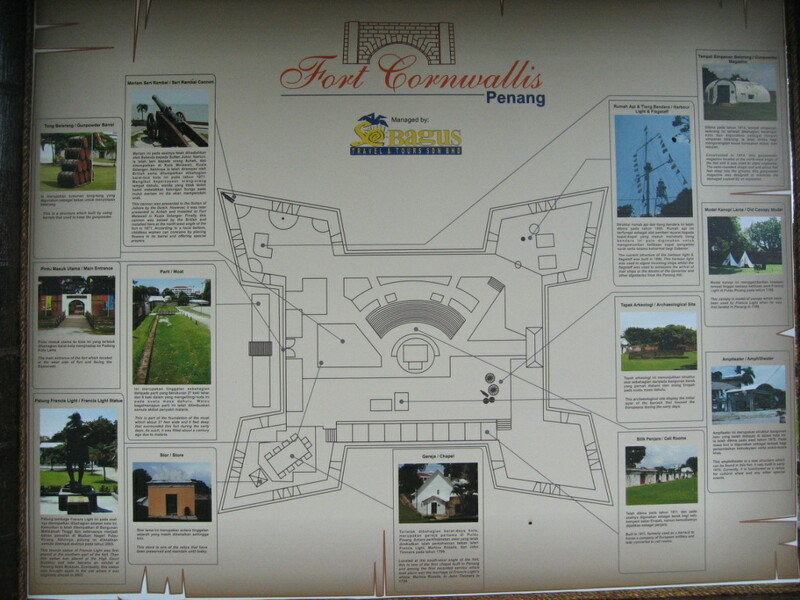 Early pictures of the Fort showed a moat surrounding the fort walls and also a number of buildings within the compound. A small group of Europeans resided within the walls whilst the Sepoys lived in Attap huts just outside of the fort.The moat was filled in a century ago due to the escalating problem with malaria in the area. 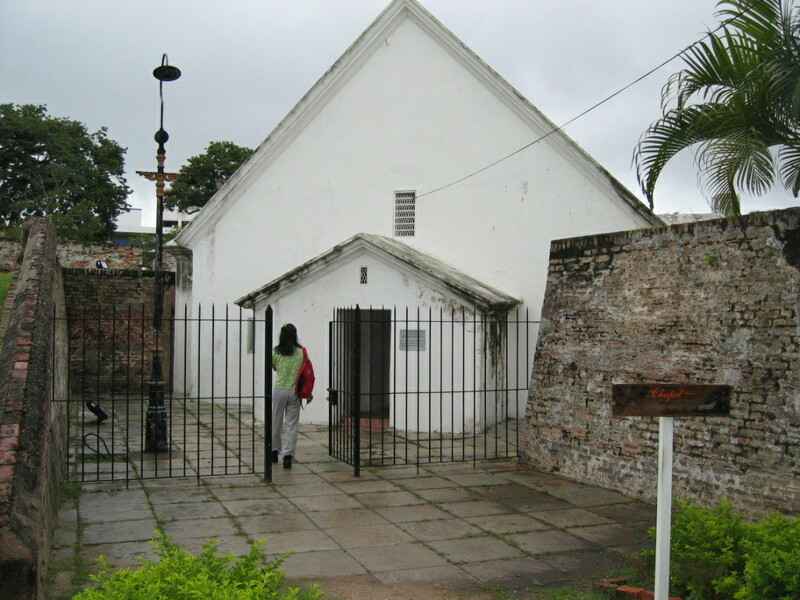 Today, the Chapel, the cells, gunpowder magazine and a few cannons remains at the fort. The tiny chapel I had its first recorded consummation of marriage in 1799 when Sir Francis Light's widow, Martina Rozells was wed to Mr John Timmers. The cell was built in 1811 and was formerly used as barracks to house artillery and later converted to cell rooms. These cell rooms are currently used to house a little museum. The Gunpowder Magazine was added in 1814, and was built to store explosives. Next to this are the cannons. The most noted of cannons is the Seri Rambai Cannon. This cannon was initially presented to the Sultan of Johor by the Dutch. 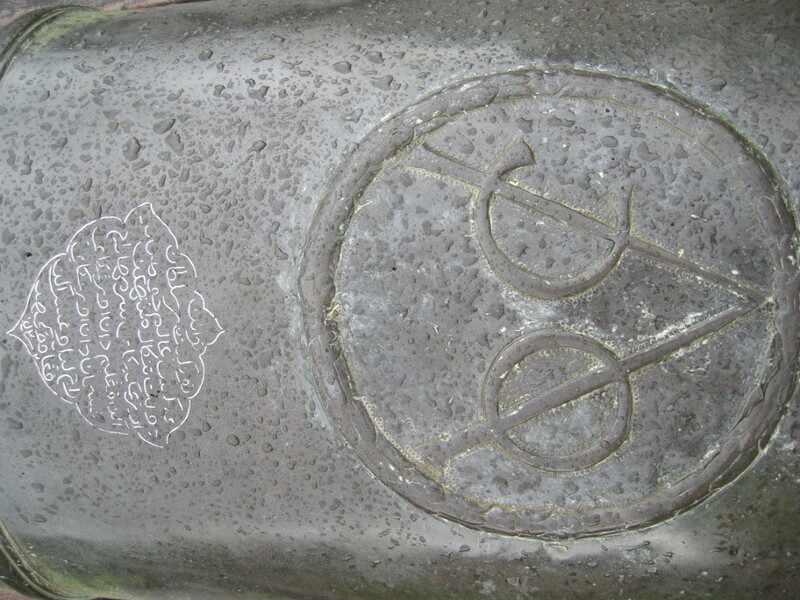 If you look closely, you will just make out Dutch East India Company's seal, VOC inscribed on the cannon. However, later the invading Achehnese confiscated the cannon and gave it away to the Sultan of Selangor. Eventually the Madras Native Infantry seized Seri Rambai and brought it to Penang. The cannon still sits at a vantage point, facing the open ocean, seemingly lying in wait for a resurrection of days gone. So, there's a way to redeem the admission fee by spending your extra time and more money(!?!) at the Kota Cornwallis Dine & Coffee. You will be able to redeem a voucher to the amount of RM10 per person if you spend a minimum of RM20 per person. These Kota redeemable vouchers are issued upon purchase of your tickets at the fort's entrance. The catch is this... it's not going to get you your RM10 if you only order a coffee... cos that one cup will only cost you RM14 - RM16.. This is what happens when such property is handed over to private entities who have not a notion how to make the best of the situation so that everyone benefits from the partnership. Then by the time it's up and ready, you can consider visiting the fort. As for now... go, explore but unless you have an immensely imaginative mind not unlike Lewis Carroll or JM Barrie... it may bore the daylights out of you. Too far to transport loved ones back to their homeland, the Christian Cemetery is the final resting place of many pioneers including Sir Francis Light, Sir Stamford Raffles' brother-in-law and a young officer named Thomas Leonowens.Walking along the pathways of the cemetery provides a sense of the hardship that early pioneers had to endure in the tropics. 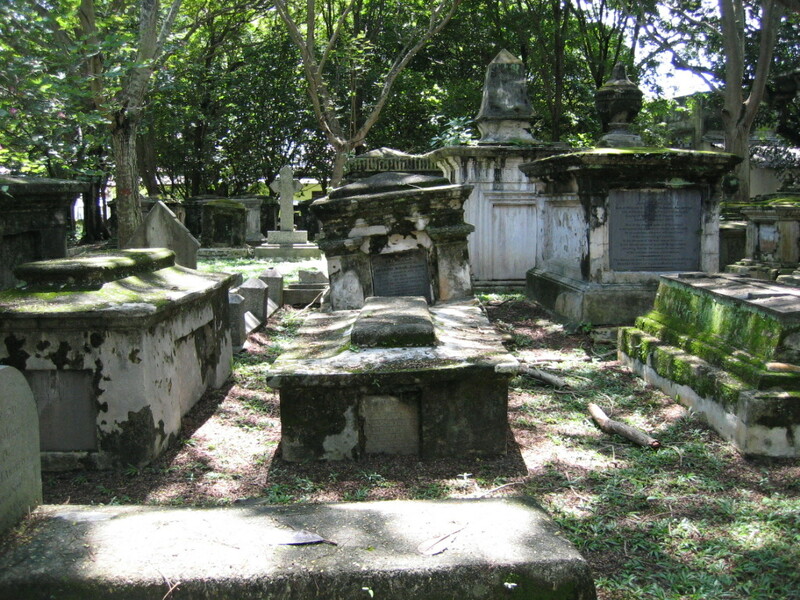 The Penang Heritage Trust has restored many of the tombstones at the cemetery however, a number of the early graves have gone through too much weathering for restoration. Reading the epitaphs brings back the romance of an alien land ~ the journey, the life and eventually death of the early settlers. Many early European settlers, young and old succumbed to a mysterious tropical fever, possibly malaria whilst soldiers of all rankings perished in the line of duty. After her husband died of apoplexy in Penang, Anna moved to Singapore, where she received an invitation to teach English to the children of the Siamese King. She later embellished her memoirs of this time, which became famous. Her romanticised account of her life in the East inspired a play and subsequently a film, 'Anna and the King' starring Deborah Kerr and Yul Brynner . A remake of this film in 1999 starred Jodie Foster and Chow Yuen Fatt. A number of the backdrops were filmed in Penang's Georgetown. To encourage settlement in the newly formed trading post, Light gave land away to anyone who would settle here. Soon, large numbers of Indians, Chinese, Malays, Burmese, Thais, Sumatrans and Javanese moved in. 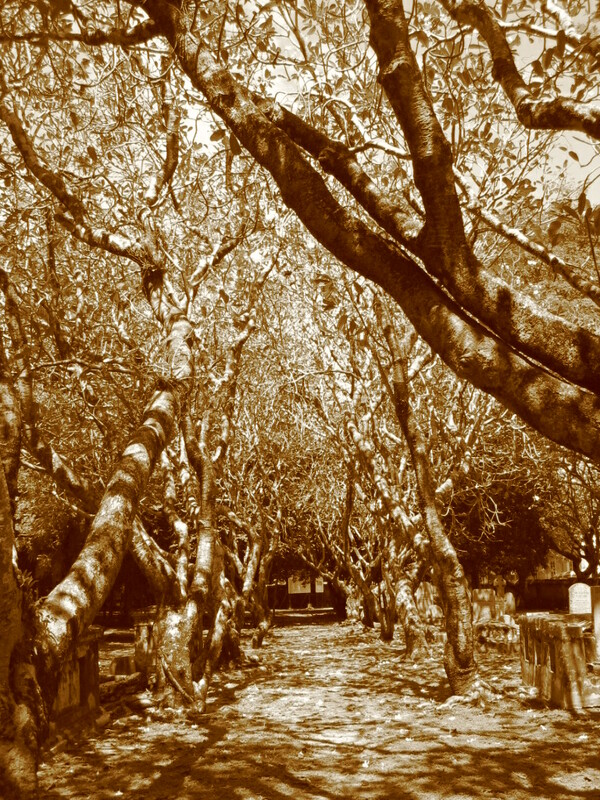 A vast swampy area, on the south of Fort Cornwallis was cleared out to create quarters for the Asian population. Not long after, Armenians, Jews, Persians and dozens of other races came to settle at Georgetown. Walking through the streets of Georgetown, one can still just about make out the quarters for the various races or even the type of trades conducted by these merchants. Suffolk House served as the governor's residency for the first 100years and later was bought over by a planter. Eventually the house and land became part of the Methodist Boys' School, last used as a canteen for the students. Every day between 10am and 6pm. Entrance tickets cost RM20 per person (children below 12 are free) and this ticket may be redeemed for refreshments, or in part payment for any meal.